The opportunity to leverage video by producing valuable content presents great potential for individuals and organizations, and audiovisual professionals are uniquely positioned to provide this. While video plays a significant role in the world of AV, its value to organizations is often under-appreciated. Aside from viewing a professional broadcast, consuming recorded content, recording a program for future use, or creating and viewing homemade footage, the benefits video have remained fairly consistent in the business and consumer space over the course of many years. With recent advancements of smartphones and tablets, along with the prevalence of YouTube, Netflix, Amazon, Facebook, and other online services, the availability of video for playback and recording has grown significantly. Additionally, the quality of video produced by cameras and microphones on mobile devices and webcams has noticeably increased to the point of production quality under the proper settings. Currently, more people than ever have access to viewing and creating video—and yet, not enough emphasis has been put on what video and content production can do for businesses and organizations. Here are some tips for using video within a business, organization, or institution. In a world of perpetual access to work email, calls, and information, it seems the attention span of most employees has shortened. It is too easy to get distracted. Participant engagement, effectiveness of communication, efficiency of calls, and personal connections are significantly enhanced by video calls as opposed to audio calls. Whether it is for an important conversation, a daily huddle, a job interview, technical support and troubleshooting, or updates from remote locations, adding face-to-face and/or visual content increases effectiveness and focus, relieves tension, and creates familiarity. 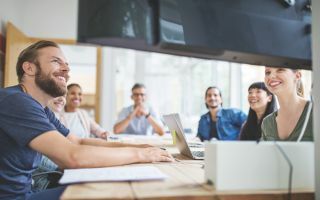 For remote work teams, the value of video to foster and deepen relationships between coworkers can be a difference maker, especially for those who only meet in person occasionally. Body language, facial expressions, posture, and dress can all enhance the message using video communication. Video also does wonders to turn a voice on the other end of a phone into a real person. A great way to convey a message is through a recorded video. Whether to demonstrate a product or service, document a process or procedure, define a responsibility for delegation, or communicate “how to” instructions, video serves as a highly effective communication method. The use of video in these instances not only provides clarity and specific detail, it allows the information to be easily archived, referenced, and shared while providing consistent effectiveness. A good example of this effectiveness can be seen in workout videos. The ability to see, rewind, re-watch, and reference the moves of a workout are far greater than a written description, step-by-step pictures, or even a live demonstration. As alluded to in this example, words on paper or even pictures do not offer the same impact or outcome as video. If a picture is worth a thousand words, video is worth at least ten thousand. Now with the availability of quality video recording within arm’s reach at almost all times via mobile devices, producing video is so easy and cost effective. Since the next-best thing to speaking with someone in person is to communicate via video, why not send a video recording instead of a common email or text? A video clip offers additional opportunity for creativity, clarity, personalization, deeper connection, and differentiation. Since video messages are not a common occurrence, it is highly likely that a personalized video will stand out, receive recognition, and warrant a response. This could be very useful when trying to gain someone’s attention. The practice of producing corporate videos can be a big investment requiring significant planning and effort. They can also be viewed as overly produced and edited, making them less genuine. On the flip side, what might be seen as an amateur recording can provide greater impact. What homemade video lacks in refinement and professional quality, it gains in authenticity, creativity, and intimacy. Even a 30-second video clip can effectively communicate a message while conveying personality and intent. Through various social media sites, live video can be easily transmitted to share experiences, perspectives, and unique or personalized messages. Rather than sharing pictures, words, or verbal descriptions, streaming video captures an ephemeral experience and shares it with the world in real time right from a mobile device. Watching a video stream or webinar not only provides opportunity for viewers to engage with the subject matter or presenter, it also unites an audience that shares in the event and can interact with one another for an enriched experience. This is one of the reasons why webinars and live look-ins on personal experiences or events have grown in popularity. In addition to increasing the effectiveness of a message by using video, search engines and social media look favorably on the use of video on websites and posts. Next to Google, YouTube is the second-largest search engine with viewers actively seeking information and ready to consume content. Recorded client testimonials, personalized messages from leadership or team members, product or service demonstrations, and highlights from events or speaking engagements are all examples of the use of video on websites or as marketing materials. In lieu of producing blog posts simply in writing, a recorded video blog, or vlog, offers an alternative and unique way to convey information. It should be noted that not everyone prefers to consume content in the same manner due to their makeup and lifestyle. This is why audio books and podcasts are gaining traction as an alternative to written word. Video can provide the same level of added value to those who are visual learners and find their concentration and retention greater when watching video. Although video consumption has predated most of our existence, the idea of producing video is still fairly new for many. The opportunity to leverage video by producing valuable content presents great potential for individuals and organizations. Audiovisual professionals are well positioned to capitalize on this opportunity, demonstrate expertise, benefit their organizations, and continue to be revered as technology leaders by embracing video as a preferred method of communication.